"Joseph, Mary, and infant Jesus leaving Bethlehem, fleeing to Egypt." It is not difficult to harmonize Matthew and Luke at this point. Luke tells us how it came about that Mary and Joseph came from Nazareth to Bethlehem and how they went to Jerusalem when Jesus was a week old. Obviously they returned to Bethlehem where the Magi sought Jesus. Adored one day, in flight the next. Very likely the gifts of the Magi supplied the wherewithal for the flight. Very likely Luke 2:39 is parallel to Matthew 2:22ff. Matthew 2:13 When they had gone, an angel of the Lord appeared to Joseph in a dream. "Get up," he said, "take the child and his mother and escape to Egypt. Stay there until I tell you, for Herod is going to search for the child to kill him." Very likely verses 12 and 13 happened in the very same night. The Magi went east, the holy family west. "Gone" is an interesting word in Greek. It denotes withdrawal from danger or withdrawal to be alone. It is used in verses 14 and 22. Look also at Matthew 4:12; 9:24; 12:15; 14:13; 15:21; 27:5; Mark 3:7; John 6:15; Acts 23:19; 26:31. The angel of the Lord actually appeared and led Joseph step by step. By the way, that's the way the Lord leads all of us, just step by step. Most often He leads us just at the point when help is needed, not before. He is a very present Help in trouble. Bengel aptly remarks that God tried Joseph's faith by telling him no more than necessary. Clearly for quite some time God gave no direction while they were in Egypt. By the way, the accounts of the apocryphal gospels concerning their stay in Egypt are all to be discounted. We know nothing of this stay in Egypt. The angel clearly tells Joseph the reason who he should go to Egypt and stay there. Note how many of the words in this verse correspond directly to the commands in verse 13. It reminds us of the word "righteous" applied to Joseph in Matthew 1:19. He was a man of faith and faithfulness and therefore always, when commanded, shouldered the responsibility of a legal and foster father without question. Lenski remarks that people in Bethlehem must have been surprised the next morning when they discovered the absence of the holy family. Matthew 2:15 where he stayed until the death of Herod. And so was fulfilled what the Lord had said through the prophet: "Out of Egypt I called my son." Now comes the fulfillment of another prophecy. Compare the form with 1:22, precisely the same. The Lord was the primary speaker and the prophet Hosea the agent. Both spoke. Matthew quotes the Hebrew, not the LXX which makes the word "son" a plural to make it fit Israel. That in itself is an amazing idea! The prophecy was not fulfilled in Israel because Israel had long left Egypt at Hosea's time. Bengel mentions that with reference to Israel God always said that He "led", not "called." If the prophecy were typological, Matthew would have used words such as are found at Hebrews 7:3 "make like to the Son of God." The words "out of Egypt" are prominent. Already in prophecy it was God's will that Jesus would go to Egypt and be called therefrom. Though Fahling, Ylvisaker and Lenski hold the typological interpretation, we think that Kretzmann, Bengel and Stoeckhardt are preferable. They consider it a direct prophecy concerning Christ. The prophecy is fulfilled in the case of Christ, not first of Israel and then of Christ. The translations reflect the two interpretations: KJV, RSV, NIV, JB and NEB have "my son" with a small 's.' But LB, TEV, NASB, AAT and NKJV read "my Son." The following verses are skipped. The reading stresses the flight and return. Space does not allow us to go into the history of the last days of Herod the Great. We learn all this from Josephus the historian. Matthew 2:16 When Herod realized that he had been outwitted by the Magi, he was furious, and he gave orders to kill all the boys in Bethlehem and its vicinity who were two years old and under, in accordance with the time he had learned from the Magi. Matthew 2:17 Then what was said through the prophet Jeremiah was fulfilled: Matthew 2:18 "A voice is heard in Ramah, weeping and great mourning, Rachel weeping for her children and refusing to be comforted, because they are no more." Herod was buried in the Herodium, not far from Bethlehem, still there today. After a terrible death Herod was buried close to the place where he caused the death of baby boys. Matthew 2:20 and said, "Get up, take the child and his mother and go to the land of Israel, for those who were trying to take the child's life are dead." Note the similarity between this verse and verse 13. There the verb stressed haste, here the verb denotes a leisurely trip back. Again a reason is given. Who are "those" who were trying to kill Jesus? Herod and in him the entire class of mortal foes. It is euphemistic. Matthew 2:21 So he got up, took the child and his mother and went to the land of Israel. Though it is not said that it was "during the night", Joseph acted promptly. Secrecy was not demanded this time, but prompt obedience was. There was no flight from danger now. This apparently means that Joseph had not yet heard about Caesar Augustus' distribution of Palestine among Herod's three sons. When danger lies ahead, very often God does not permit us to know about it until it is just around the corner. Thus He spares us from worry and anxiety. The text plainly indicates that Joseph entered the land of Israel before he heard about Archelaus. As in verses 18 and 19, here also, Joseph is first confronted with a problem before he is given direction from the Lord. There it was a dilemma. Here it is a fear. In both cases remember that Joseph was a "righteous" man, a true responsible believer whom God tested first. Joseph was evidently going to settle either in Bethlehem, the town of his lineage, or maybe he was thinking of settling in Jerusalem because he wanted his son to grow up in the capital. In the same way as the Magi, Joseph is warned in a dream. He withdrew in order to avoid the danger. Matthew 2:23 and he went and lived in a town called Nazareth. So was fulfilled what was said through the prophets: "He will be called a Nazarene." "He lived" or "he settle down." 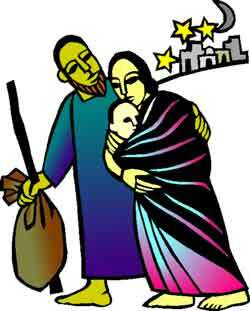 Luke 1:26 and 2:4 tell us that Joseph and Mary had both lived in Nazareth. But that was not the primary reason for which they returned to this town. The reason for their return to Nazareth was, first and foremost, because of prophecy. Of course, it was the most natural place for them to go. But the concurrence of the providence, in this case prophecy, of God and the actions of Christians, though seemingly so natural, is truly a great mystery. Fahling: Chrysostom, Theophylact, and others believe that Matthew quotes from a book in the Old Testament which has been lost. But this supposition is not even plausible. The Old Testament collection was at that time complete. Others contend that the prophecy is an unwritten one; but Matthew does not quote unwritten prophecies. Lenski: Jesus lived in Nazareth in order to fulfill the prophets; and the evidential reason, by which we ourselves can see that his living in Nazareth fulfilled the prophets, is that afterward, due to his having lived there, he was called 'the Nazarene.' We may add that even his followers were called 'Nazarenes' . . . . A Nazarene is one who hails from Nazareth. Matthew counts on the ordinary intelligence of his readers, who certainly know that the enemies of Jesus branded him the 'Nazarene,' that this was the name that marked his Jewish rejection and would continue to do so among the Jews . . . . One and all of the prophets told how the Jews would despise the Messiah, Psalm 22:6; Isaiah 49:7; Daniel 9:26, every prophecy of the suffering Messiah, and every reference to those who would not hear him, like Deuteronomy 18:18. Most of the commentators hold the explanation given by Kretzmann. Kretzmann: The most plausible explanation 'Nazarene' of 'man of Nazareth' contains the reference. For the name Nazareth is derived from a Hebrew root meaning a branch or tender offshoot. Thus the Messiah is called in Isaiah 11:1. And this passage is analogous to the expressions used in Isaiah 53:2; 4:2; Jeremiah 23:5; 33:15; Zechariah 3:8; 6:12 and to other descriptions of the humble appearance of the Messiah. Of these explanations only Lenski and Kretzmann are recommended. In any case, we must insist that the fact that Joseph and Mary settle in Nazareth and that Jesus was known as "the Nazarene" were because of prophecy. Jesus was later known as "the Nazarene" sometimes in derision, sometimes by way of compliment. Look at Matthew 26:71; John 18:5,7; 19:19; Acts 2:22; 3:6; 4:10; 6:14; 22:8; 24:5; 26:9. And it is truly remarkable that, in the providence of God, even Pilate used this name to identify Jesus in the superscription on the cross. Adapted from Exegetical Notes, Series A, Festival Season Sundays Gospel Texts, by Harold H. Buls, Concordia Theological Seminary Press: Ft Wayne IN, 1980, pp. 16-18. Used with permission.